Coverage: Live on S4C. Also live on BBC Radio 5 live Sports Extra & BBC Sport website and BBC Sport app, plus live text commentary. 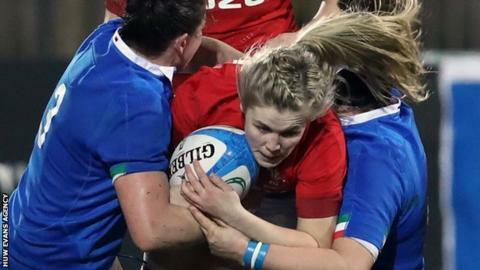 Flanker Alex Callender will make her first start in a Wales team showing five changes against England in the Women's Six Nations. The 18-year-old is picked the back row ahead of Manon Johnes, with Mel Clay returning at lock after injury. Elinor Snowsill comes in at full-back with Hannah Bluck and Jess Kavanagh included at centre and left wing. "Alex has impressed off the bench in both our Six Nations games so far and deserves a chance," said Phillips. Wales were beaten 52-3 in France and drew 3-3 with Italy and go into Sunday's game with only Scotland below them in the table. "England are such a powerful team and that gives them attacking opportunities," added Phillips. "It will be up to us to meet that physical challenge but it's tests like these that can make players and teams. "We are determined to continue to develop as a team and compete against the best sides in the world. We know we still have a lot of work to do but there is a lot of momentum in our young group and in the talent coming through in Wales at the moment." Wales: Elinor Snowsill (Bristol Bears); Jasmine Joyce (Scarlets), Hannah Jones (Scarlets), Hannah Bluck (Cardiff Blues), Jess Kavanagh (RGC); Robyn Wilkins (Blues), Keira Bevan (Ospreys); Caryl Thomas (Dragons), Carys Phillips (capt, Ospreys), Amy Evans (Ospreys), Gwen Crabb (Ospreys), Mel Clay (Ospreys), Bethan Lewis (Dragons), Alex Callender (Scarlets), Siwan Lillicrap (Ospreys). Replacements: Kelsey Jones (Ospreys), Cara Hope (Ospreys), Cerys Hale (Dragons), Natalia John (Ospreys), Alisha Butchers (Scarlets), Ffion Lewis (Scarlets), Lisa Neumann (RGC); Lauren Smyth (Ospreys).